I would like to begin this article by stating, without hesitation, that I am extremely proud to be part of the Section 9 Wrestling community. This past weekend at the NYS Wrestling Championships in Albany, our section was represented by 36 student-athletes who poured their hearts and souls into every match they wrestled. They put it all on the line and gave it their best. They competed hard; however, win or lose, when the match was over, they composed themselves, shook hands, and behaved with class, dignity, and respect. I hope you are all proud of yourselves…I know that I am. Andy Martinez (11) Liberty – 6th at 182 D2. Great Job Guys!!!!! I believe, though, that NOW is the time to address and fix two “issues” which, in my opinion, exist in Section 9 Wrestling. The first problem is quite obvious. As a section, we finished near (or at) the bottom in both divisions. D1 finished 9th of 12 and D2 finished 12th of 12. I understand that S9 is a rather small section in comparison to some of the other sections, but I think we can all agree that we can do better. The second problem is not quite as obvious, but, arguably, is the root of problem #1. Those who attended the state tournament this weekend can vouch for what I am about to say… Section 9 Wrestling needs to unite. Our fan base was, by far, the most fragmented of all of the sections in the arena this weekend. When a S9 wrestler did something great, applause was usually heard from a small, defined area of the arena….safe to assume the applause was coming from the fans of a particular “school. ” When wrestlers from other sections did something special, a loud applause from a rather large section of arena was heard. Fans from the entire “section” were cheering the event. Please do not take what I have said as a criticism of our fans…it is not. Those of you who know me, know that finger-pointing is not my style. My goal is simple…to unite our section thus making us stronger. Fortunately, if what I am saying is true, there may be one solution to help fix both problems. In comparing S9 to some of the more successful wrestling sections around NYS, one glaring difference is that we are one of the few sections that does not have a strong “club” presence. Most other sections have several club options. Many of our elite S9 wrestlers travel to other clubs to hone and sharpen their skills in the off-season. Do not misunderstand me….I am all for it. It is awesome that these athletes and their parents are willing to go the extra mile to improve their skills. What I am suggesting, however, it would be great if we had a wrestling club option right here in our back yard. A club where scores of S9 wrestlers would attend. A club that would provide an opportunity for our wrestlers to work out and practice with each other during the off season. A club that could provide a platform for our parents to get to know one another thus creating a more unified fan base at the state tournament. Over the next few weeks I will be posting articles to help promote some of the off-season wrestling options that exist for our S9 athletes. Today, I will start by writing about the option that I feel has the greatest potential for success… The West Point Wrestling Club! For the life of me, I cannot figure out why there is not a stronger “link” between Section 9 Wrestling and Army Wrestling. Trying to figure out “why” this is the case is an absolute waste of time….let’s just change it….starting today! The Army program is on the rise. Second year Army Head Coach Joe Heskett has a motto for his Division 1 program, “Build and Believe.” Is there a more appropriate motto for S9 Wrestling? For the past few days, I have had several discussions with Army Assistant Coach Terry Madden. Coach Madden, a Pine Bush graduate, is a 2X Section 9 Champ and a Division III National Champion. He and I share the same vision and he assures me that Coach Heskett and the rest of the Army staff feel the same way…we would all like to see The West Point Wrestling Club become “the place” where Section 9 wrestlers train during the off season . Take a look at what this club has to offer. The club currently practices on Mondays and Wednesdays from 7:00 p.m. until 8:30 p.m. at the Arvin Gymnasium on the beautiful campus of the United States Military Academy at West Point. The club is currently exploring the possibility adding other locations as well. 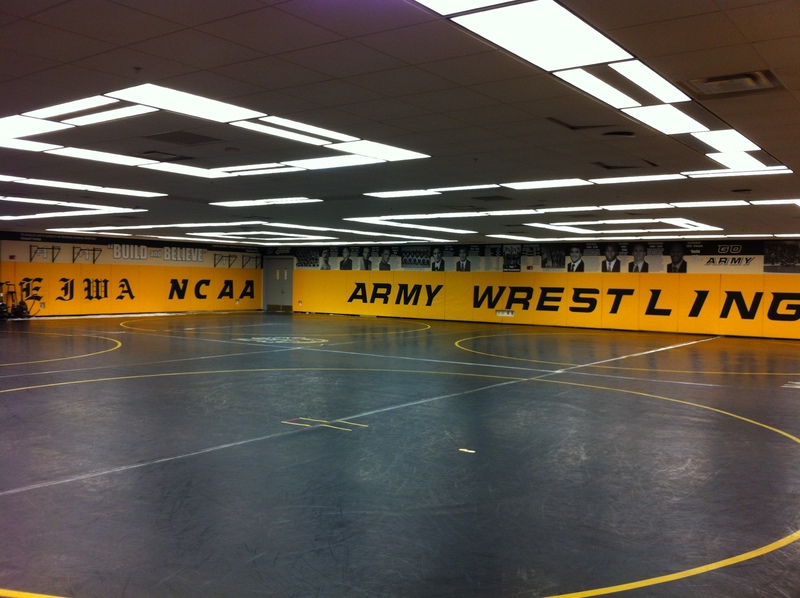 The West Point Wrestling Club is offering an introductory rate of $75 per month! That is less than $10 per practice session!!! Come train with an elite Division I coaching staff right in your area. With Coach Heskett’s motto of “Build and Believe”, set your goals and let us help you make them become a reality! Come train not only with fellow peers, but also Army cadets! Remember, what you do with yourself on the off season, always reflects the upcoming year. Come work out where training is taken serious, Army serious! How would like to train in this room??? Mike – Your comments could not be more spot on. It was disheartening the see a section 2 wrestler walk on the mat against a section 9 wrestler, because you knew in your heart that kid spends his off season at Journeyman. As the father of a two-time section 9 champion and a senior wrestler at West Point, I would like to echo your comments loudly. For us to approach the cohesiveness we saw in Albany this past weekend in other sections, we need to spend more time together in the off season. Heart, determination and dedication are table stakes, but to become a truly great wrestler, you need a first rate training facility, excellent coaches and mat time, mat time, mat time. A closer tie to the West Point Wrestling Club will pay huge dividends for our future wrestlers. Finally someone said it. I have been to the states the past few years and have noticed the same thing. I have also heard some coaches would rather not have their wrestlers working out with other wrestlers from the same section. As a section we must look at each other as family during the states and the off season. My sons have both finished their HS wrestling careers but I will continue to support section 9 wrestling and look forward to seeing if changes happen. I also have heard people say that they do not want their wrestlers to practice with other kids from the same section. Quite frankly, I have a hard time wrapping my brain around it. Have they any idea what the Olympic Training Center in Colorodo Springs is???? Do they realize that these athletes practice and train together every day….heck they actually live together! I promise you, they have a lot more “on the line” than a HS wrestler does…mind-boggling!!! I also have to agree 100% with everything you said. I was in Albany this weekend and the unity among sections (particularly 2, 5, 8, and 11) was immense. I fully believe that in order for Section 9 to be in the upper tier of NYS wrestling there needs to be a central club that kids can attend within a reasonable distance of our schools. Improvement can only go so far when you are wrestling the same 1-2 wrestling partners all year long. Does the West Point club work with youth or primarily high school aged? The West Point Wrestling Club accepts athletes of all ages – grade school, middle school, high school and we even have several aspiring Olympians training in the Club. Great article Mike. Let me know if there’s anything I can do to help out pal. Mike I was there and you hit it on the head. While Section 11 looked and sounded like a well oiled machine, Section 9 was scattered. I currently live in Section 1, but was born and raised in Section 9. I still have a heart for Section 9. I even heard that when another section arrived, they came off of the same bus, all of them. Now that’s what a team should look like. Instead we had about 35 wrestlers come in about 20 different vehicles. There is no cohesiveness, and instead of looking like Section 9 at the states, it looked more like the sectionals all over again. First off, congratulations to all of the participants. It is obvious that this was an incredibly tough tournament. I echo Mike Carey’s sentiments regarding how our team conducted itself, particularly after seeing how some of the other athletes reacted to losing. I would like to thank the Warwick coaches Szumlaski, Barquero and VanDeWater for inviting other section finalists to practice with his team. Hats off to Shane Connolly for being a class act and for his prestigious high school wrestling accomplishments. I also agree that it would have benefitted the team to train and travel as a unit. I suggest that there should be several mandatory practices for the team in the future. On the whole, I didn’t feel a real sense of unity. I would have loved to sit with all of the section 9 parents at the tournament. The West Point Wrestling Club seems like a reasonable option for our wrestlers, but we all have to get on the same page. In closing, as a parent, it has been a joy watching my son Colin wrestle over the last 5 years and seeing all of the friends he has made throughout the section.Thanks for the memories and GO SECTION 9. I thought our section 9 team practiced as a team during the 2 weeks before the tournament. I thought the school that had the most section champions would be the school were the section 9 team practiced. To find out that this is not the case is shocking. If practice partners are needed because everyone on the team is at different weight other wrestlers in the section could be work out partners for the 2 weeks leading up to states. This gives a chance for other wrestlers in the section to get a chance to work out with the section champion at their weight. It could only make the work out partner better. I do feel there was a poor turn out for wrestling fans of Section 9, however unless we can do a better job it is hard to blame them. Most of the Section 9 coaches and fans were in the 114/115 section of the stands which is where we usually stay. When a section 9 wrestler was wrestling everyone was rooting for him regardless of school, the problem was that there was not to much of us. I feel that a big part of section 11, 1, and 2 success is that they have clubs where the top wrestlers work out with each other and make them better. I personally would like to have our wrestlers train together in the off-season to make us better. I believe that most coaches would agree that this would make us better. It is nice to hear one of the highly respected coaches in our section give his opinion on this subject. There are some other highly respected coaches in our section, I would also like to hear their opinion. Coach Fischbein, I commend you for being the first coach to step up and give their opinion. I think its a great idea Mike! I have to say its been great my son Dylan is graduating this year but we traveled every where over the summer to keep him working!! My son loves wrestling- he will be wrestling in college! To Tom Casey- you have a great son too- it’s been nice knowing him and watching him wrestle! !And Shane is a class act- great kid!! I want to thank Mike, Tim for the great updates..and KJ broadcasting! The warwick families..you guys r awesome!! Thanks for all the great memories Section 9 & friends of section 9!! To all the wrestlers that are graduating- Good Luck!! More mat time is definitely the answer. Coach John Bell used to host the NY State Freestyle qualifiers. Where has Freestyle in Section 9 gone? I teach freestyle but some parents look at me like I have two heads. They think its crazy and unsupportive to folkstyle. Freestyle definitely helped my overall game. Hello people, it is the what the rest of the world do! Freestyle/GrecoRoman is what they do in the Olympics. We built great relationships with kids from other schools wrestling all summer. Remember the Empire State Games? On a positive note, i do see a lot of local comradory amongst local competitors. There is just not of enough clubs around. Great dialogue Mike. Talks like these are sometimes the birth of great things. other schools wrestling all summer. Remember the Empire State Games? On a positive note, i do see a lot of local comradory amongst local competitors. There is just not of enough clubs around. I agree with Mr Macaluso on the importance of off-season freestyle wrestling. My son Tom wrestled freestyle all summer and was fortunate to wrestle with the New York National Team. Wrestling freestyle definitely improved his overall skills and, I believe, helped him open up on the mat I would strongly recommend younger wrestlers to give freestyle a shot FYI- Brian and Dylan Realbuto of Somers wrestled freestyle all summer with Tom and seemed to do okay this folkstyle season. Two State Champs! Good Luck to all future Section 9 wrestlers! The Freestyle Qualifier will be @ Middletown on 4/21. We are finalizing some of the information as we speak and we will get it out ASAP. Sorry for the delay.